RASA was started in the fall of 1998 when Hans Christian first met Washington DC based Kim Waters at a music party in Marin County, CA. Her tender and sensual way of singing Vedic chants immediately captured his ears and within weeks they started to record together. 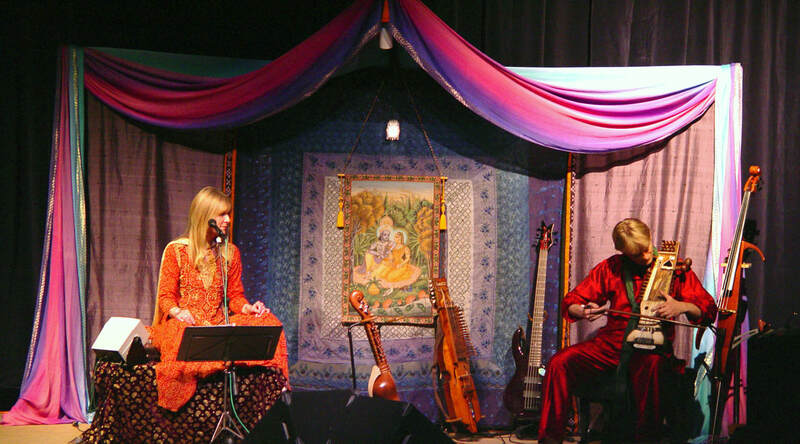 Over the span of the next seven years, Kim and Hans toured nationally and released six CDs on the Hearts Of Space and New Earth Records labels. Their unique devotional sound, combined with a sophisticated production, captured audiences around the world. Most of their material stems from the Vaishanva tradition- dedicated to the worship of the Divine in the form of Krishna, but their western roots brought this esoteric material into the mainstream of western culture. RASA was, in a sense, a pioneer for many chant artists who followed in their footsteps. To this day, Kim and Hans enjoy recognition for their music under the name RASA. Kim Waters comes from an artistic family. Her father David Waters was a talented painter and comedian and worked in Chicago in the news business when Kim was born. After hosting Secretary of State John Foster Dulles on his news program, David was offered a position in the White House where he ended up working as Assistant Chief of Protocol in the Johnson and Kennedy administrations. Kim's mom had many artistic talents as well, and her sister Kerry is a professional actress in Washington DC. As a teenager Kim went to Woodstock and soon afterwards started to associate with followers of A.C. Bhaktivedanta Swami. Her creative spirit manifested a voluminous collection of paintings titled "Illuminations from the Bhagavad Gita"- colorful, very detailed depictions of scenes from the ancient Vedic texts. The collection was published several times in book form and is now part of the permanent collection of the Museum for Sacred Art (Florence, Italy, Belgium). RASA always brought its own complete stage setup. Besides a custom sound system and monitors, the stage decor consisted of an intricate "temple- like" free standing back drop, made from Indian fabrics that were hung over a free standing frame. Every little detail was figured out and Kim became a master at setting it up in about 15 minutes!